This paper discusses a dimly lit and largely unknown time in the life of a great biochemist. 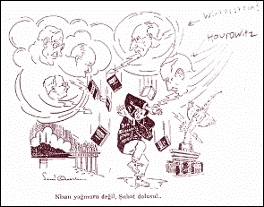 Felix Haurowitz survived extermination because starting in 1933, Turkey reformed its higher education by inviting many intellectuals fleeing the Nazis and for whom America was out of reach because of restrictive immigration laws and wide spread anti-Semitic hiring and gender bias at its universities. This visionary act on the part of Turkey’s government had the collateral benefit of placing in escrow an intellect that went on and helped to expand America’s view of biochemistry and immunology. REISMAN, Arnold. Exiled in Turkey from Nazi Rule, Eminent Biochemist Felix Haurowitz Became Indiana’s Adopted Son. AmeriQuests, [S.l. ], v. 4, n. 1, feb. 2007. ISSN 1553-4316. Available at: <http://ameriquests.org/index.php/ameriquests/article/view/94>. Date accessed: 23 apr. 2019. doi: https://doi.org/10.15695/amqst.v4i1.94.